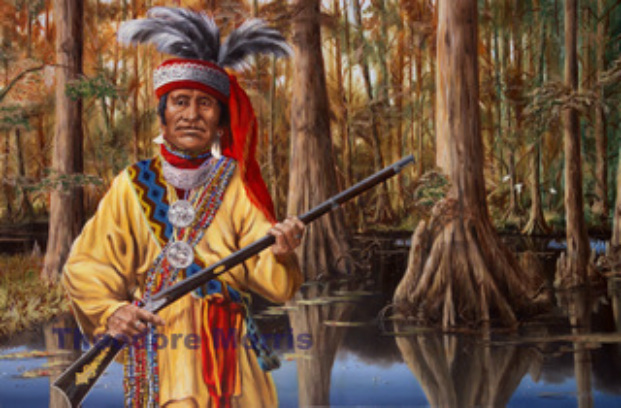 After the end of the Second Seminole War, Holata Micco and his followers lived in peace with white settlers near their home in the Big Cypress Swamp. 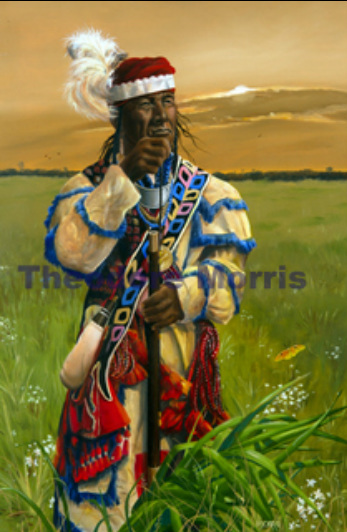 In 1855, Holata Micco and 30 of his warriors attacked a U.S. Army survey party who had destroyed some of their crops and were recording the location of their villages. I based this painting on a drawing of Billy Bowlegs created for a northeastern newspaper in 1858. It was pointed out, by a Seminole, that his shirt is wrong and would include a design pattern. I felt he should be pictured in the land he loved. This Seminole dresses in traditional tribal garb and is based on a display at the history museum in Naples. The second Seminole war lasted from 1635 to 1842. It started when the United States government tried to remove the Seminoles from their ancestral homeland in Florida. I painted the dramatic sun setting behind a cloud as a symbol of the removal from Florida of most of the powerful Seminole tribal members.